Meteorological winter is now two-thirds over. Since beginning back on December 1, southern New England has seen little in the way of cold and snow. Winter just can’t seem to gain a foothold in New England, and the reality is it may never do so this winter. With temperatures near 60 this afternoon along with some sunshine, the feeling of spring will abound. The record for today, set back in 1989, is 66 degrees. We won’t come close to it, but with temperatures as warm as they are, you can safely say this is one of the warmest starts to February on record. We only have to reach 57 for today to be considered one of the top five mildest starts to February. For those forecasters who predicted a cold, snowy winter, it’s becoming less and less likely this will be the case. One can certainly point to last year and other years when snow and cold began late in winter and continue through March, and while I still expect the second half of this month to be colder than the first, the winter of 2015-2016 will likely be remembered for the lack of snow and cold, not the prevalence of it. Many forecasters in New England have a deep love of the cold and snow, so there’s an unconscious tendency to hunt for it on the models. If you listen carefully to forecasters over the next week, you’ll hear many of them focusing on the possible snow and cold beginning this weekend or during next week. NOAA thinks the coldest of the cold air stays west of New England, and I tend to agree. At this point I’m looking at reasons why the pattern will continue, not why it’s going to break. I’d rather go with the grain of the atmosphere this winter than look for reasons to go against it. After all this warmth, it’s easy to forget what is typical. On average, we’d see about 18-28 inches of snow across much of the area from today through the final flakes. 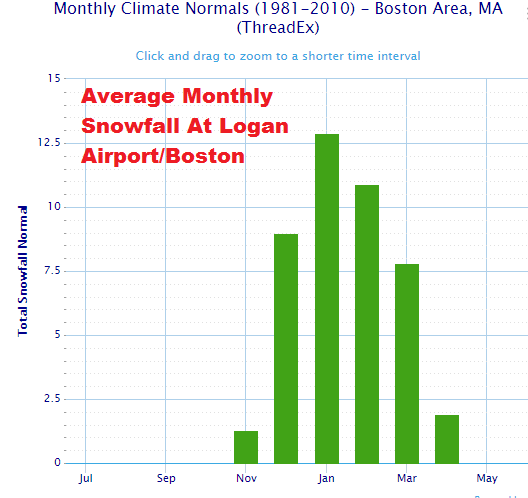 If Boston received average snowfall the rest of the winter, which I think is unlikely, we’d still end up with a winter far below typical in terms of snowfall. For December 1 through January 31, temperatures are averaging so much warmer than average I’m confident saying that this year, meteorological winter will end up warmer than average. Yes, it’s going to turn colder later this month, and the cold could last a week or more, but that’s not a big deal in the big picture of the whole winter. The bottom line is we still have at least two arctic outbreaks on the horizon, and I still expect several chances of snowstorms—maybe even a big one. Two of three of the coldest, snowiest months are now behind us, and we got away very easy. This month, we gain an hour and quarter of daylight and five degrees on average temperatures. In only 29 days will we really know how bad February actually was, it will be fun to see it unfold. Please follow me on Twitter: @growingwisdom.